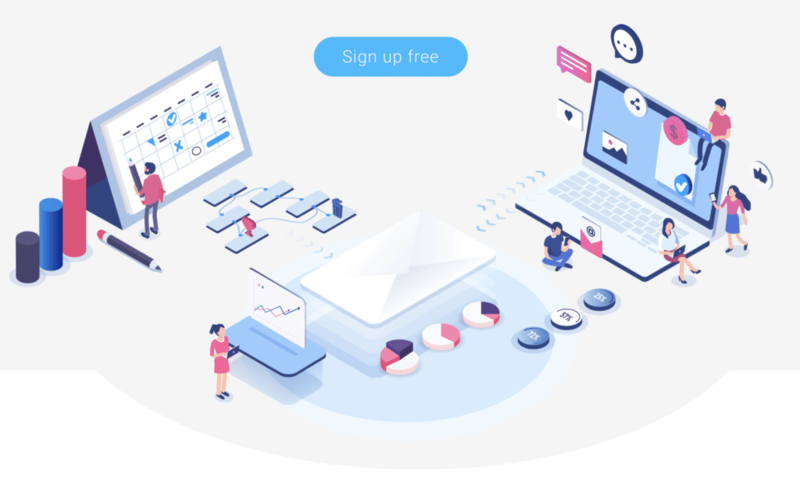 GetResponse touts their all-in-one integration that makes it easy for businesses to handle all their email marketing and automate their marketing in general, while also providing tools to grow your audience through resources such as landing pages. GetResponse is a strong solution for providing online campaign management, autoresponders, custom workflows and even a high rate of deliverability. GetResponse tries to stand out from their competitors by providing a wealth of features, a lot of survey tools and reporting functionality, and a focus on creating beautiful-looking email campaigns and landing pages to push a higher response rate. GetResponse has done well to create a very pleasing-looking user interface in the back-end, and also well-designed emails and sign-up forms. This makes the emails that businesses send through the program easier to read, which often results in higher conversion rates. GetResponse doesn’t just stop at email marketing, though. One of the features that separates them from other competitors is the program integrates directly with Salesforce, allowing businesses that use the CRM system a seamless way to reach out to their current customers and prospects. Other popular apps the software integrates with include Magento, WordPress, Facebook, Slack, and PayPal. In addition, GetResponse offers the ability for their customers to host webinars on their site through the software, as well as the functionality of creating landing pages that can help build visitors into potential future customers. Despite the impressive advanced features, GetResponse is best for small businesses and those who are just starting to build out their email marketing plan. The software has easy-to-use back-end functions such as the ability to drag and drop items into email campaigns through their creation tools. Even still, because the software offers some advanced features and, most importantly, an attractive looking front-end, GetResponse is one of the more popular email marketing software solutions for businesses of any size. Getresponse offers four basic plans, based around both a company’s email list size and what functions they desire. All plans come with email marketing tools such as autoresponders and landing pages, as well as marketing automation tools such as workflows and tags. The cost of each plan will increase as your list size increase. 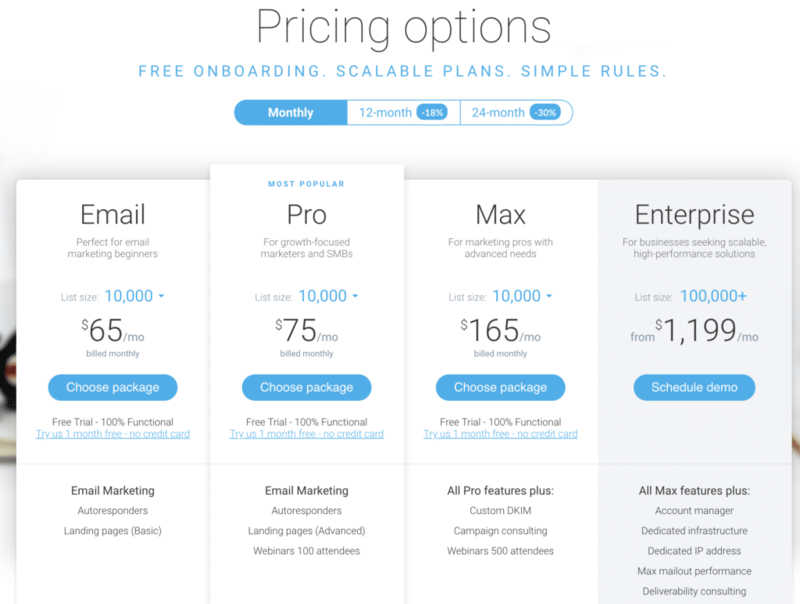 For example, the Email Plan costs $65 per month for a list size of 10,000. As you choose a higher plan, the features that become available to you will increase as well. GetResponse offers an 18 percent discount if you pay in advance for one year, and a 30 percent discount if you pay in advance for two years. All plans come with a fully functional one-month free trial, with no commitments. GetResponse provides a very impressive customer support offering. They provide 24/7 live chat support, even on weekends, through their website, as well as email support in seven languages. In fact, GetResponse has won numerous Stevie Awards for their customer support. In addition to the direct response support, the company offers a wealth of customer support resources on their website as well, including whitepapers, reports, guides, infographics, videos, podcasts, a glossary of popular terms and even something they call GetResponse University that provides webinars, course, and even more guides.